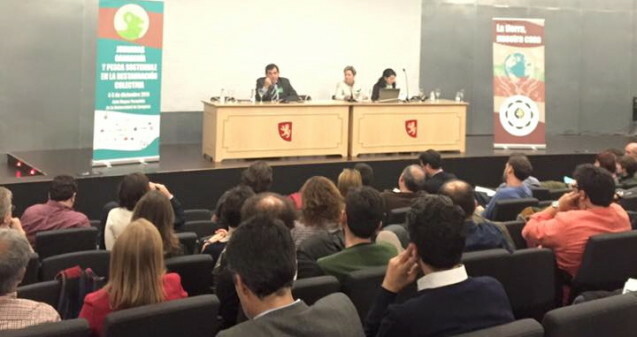 Eating City has participated to the constitutive assembly of Mensa Civica on November 20th in Zaragoza. This event brought together not less than 90 people belonging to more than 60 economic, social and professional organizations, carrying out activities within food and catering business. They have approved the founding Manifesto of Mensa Civica, the statutes of the association and the creation of a group of 6 people responsible for driving the chargées de piloter the operational launching. Participants gave themselves until December 31st before this new network is going full force. The establishment of a legal entity will allow Mensa Civica, that has existed already for several years, to implement and participate to national and european projects, in particular to support a responsible food procurement policy in hospitals. Indeed Mensa Civica is networking several Spanish hospitals , whose the hospital “Virgen de las Nieves” in Granada, which is pioneering in Spain in such activity. Furthermore, this spanish network will carry on its work on certification requirements for sustainable public food service. Maurizio Mariani, president of the franco-italian Consortium Risteco and promoter of the platform Eating City has presented in the opening session the challenges raised by the necessity to integrate health and cultural aspects in the development of sustainable food systems in Europe. From that perspective, Public Food Service is a powerful lever for societal action.